This was the most accurate and detailed map of the Chesapeake Bay area for over a century. By making this map, Captain John Smith made more solid geographic contributions to the knowledge of the East Coast than anyone else in the seventeenth century. This voyage to make this map began in June 1608, just months after being released from capture by Powhatan. Captain John Smith undertook this journey of discovery and exploration of the largely unknown and unrecorded Chesapeake Bay in a 27 foot long sailboat with a dozen men. Looking at the map today, Smith’s geographical accuracy is astounding given that he traveled about 2500 miles and had only primitive mapmaking tools to work with. It seems unbelievable that he was able to accomplish this voyage in only two and a half months. Smith and his men fought battles during their exploration and met giant-like Indians (see their picture on the map). Captain John Smith should be recognized as the greatest founder of the American colonies. 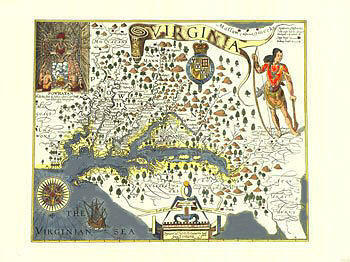 His maps prepared the way for settlement of Virginia. Unlike the blurry picture above, the map for sale is crisp and sharp in detail. If you wish to purchase a copy’s of this map, email me by clicking the link below. Tell me how many copies you wish and I will quote you a cost including shipping.